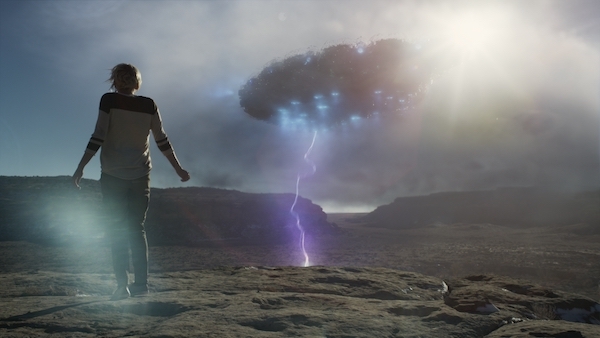 Fulvio Sestito's directorial debut, “Beyond the Sky,” blends his passion for filmmaking and fascination with alien abductions into a unique sci-fi thriller. Starting at Rome's Cinecittà film program as a teen, Sestito made the jump to UCLA to study directing and cinematography before starting a visual effects boutique shop with his brother. Directed from a story Sestito co-wrote, the movie follows documentarian and skeptic Chris Norton, who is determined to debunk abductee stories after his father's obsessive belief shattered his family. Norton heads to a UFO convention, where he meets Emily Reed, a young woman who claims that she is abducted every seven years on her birthday. With Emily's 28th birthday fast approaching, Chris's quest for the truth uncovers more than he ever imagined. Caitlin Malcuit: Tell us about how you got your start in filmmaking. Fulvio Sestito: I've been passionate about storytelling and filmmaking since as far back as I can remember. I did my first "somewhat coherent" short film when I was 8 years old using my dad's bought-and-never-once-used VHS camcorder. Since then, pretty much every year I would drag family and friends to make short film during the summer breaks. As a teenager I attended a film school program hosted by our one and only studio in Rome, Cinecitta. I later relocated to Los Angeles and continued my film studies at UCLA, then opened my own production company and started doing commercials, music videos, and narrative projects. My first break as a director came after my UCLA thesis short film "The Showdown" was invited to several film festivals and won numerous awards which helped open doors in the industry. CM: It looks like visual effects are definitely in your wheelhouse, so how do you navigate directing your actors in such effects-heavy scenes? FS: For some reason, I was always drawn to tell stories that usually involved some type of sci-fi, fantasy, or supernatural element. My passion for VFX came from the need to having to realize scenes in my early films that could not have been practically shot. This forced me to come up with ingenious ways to achieve what I was trying to tell. For “Beyond the Sky,” it was clear early on that the way the story was structured, it led to a visually challenging third act where our characters experience an extraordinary encounter. Also, because the story was told from a very realistic documentary-style visual approach, it was imperative the VFX had to be absolutely convincing or the entire movie would not work. The first step in achieving convincing results was meticulous preparation. I spent countless hours with my good friend and production designer Kino Scialabba talking about ideas and coming up with a very precise visual style. That lead us to create many beautiful illustrations we could show our cast and crew so they all knew what the environments would look like. I also created detailed 3D animated storyboards for each sequence (called previsialization) so that I could show the actors exactly what was going on during our extensive green screen shoot. All this, pus constantly reminding my actors of the terrifying stories I would hear from real life alien abductees, helped them sustain the right emotional tone. CM: “Beyond the Sky” is documentary-style, too, which takes the sci-fi perspective to a different place, and you developed this from a story you helped co-write, so how do you go about translating a story into a screenplay? FS: A good part of the film is based on actual events that happened to me during a research trip. I was always fascinated by the alien abduction phenomenon. Not necessarily by the alien part alone, but more by the cultural and psychological ramifications. Looking for answers, I traveled to several UFO-themed conventions where I started meeting and interviewing all kinds of interesting characters. But the deeper I would dig the more questions I would find. Clues led me to experience strange sightings of my own and to the Pueblo Indians of New Mexico. Needless to say, that what started as a research trip turned into a transformative spiritual journey that questioned my own beliefs. Thematically I knew I wanted to tell this story from two different point of views. That of Chris, a documentary filmmaker who -because of his traumatic personal connection to the subject- wants to debunk the alien abduction phenomenon. His view of the world is very somewhat Machiavellian, objective, detached, and cold. The second point of view is that of Emily. She believes she has been abducted since she was 7 years old and again every seven years since. Her world is subjective, mysterious, creative, she knows what’s been happening to her is real, but can’t really prove it. This arc, starting the story from Chris’ objective point of view then gradually transitioning to Emily’s as Chris’ beliefs are challenged, became the driving spine of the script. Visually, I decided to embrace a hybrid storytelling approach. One told from the “documentary” camera Chris is using to tell his story, the other from a narrative cinematic point of view; each style representing a different interpretation of the reality our characters experience. At first, the world as seen from Chris is told with longer lenses, colder colors, the camera is more frantic, like his mind never still. Then as we enter Emily’s world, she brings warmer earth tones, slower camera moves, wider shots. Finally, as we dive into the uncharted world of the subconscious mind and the characters’ unreal experience, the two worlds collide in an explosion of cold and warm hues. Soft and stark lines, a world of contradictory opposite that somehow find a balance and beauty. CM: I didn’t catch the Travis Wilson cameo initially and I was surprised to learn that he was a consultant on the film as well. FS: I met Travis early on during my research trip. His story is the first one that made me realize I honestly could not find any hard proof that could make me disprove it. It all made too much sense not to admit that this could actually have happened. Additionally, I was surprised to find out that most of the abduction scenes in the popular film inspired by his case "Fire in The Sky" have been dramatically altered for “cinematic” purposes. To me, the events Travis recalls from his abduction were way more interesting than the one portrayed in that film. That was the inspiration for wanting to show audiences a different 'side' of alien abductions. Since then we became good friends with Travis and he graciously allowed us to shoot at an actual UFO convention he hosts called SkyFire Summit. CM: I also think the outdoor set pieces helped to enhance the film, so what was it like to film in Arizona and New Mexico? FS: Early on, it was clear to me that the visual structure of the film was going to become a character in the story. In a quest for authenticity we choose to shoot most of the film in several locations, including a real UFO convention in Arizona, and an Indian pueblo in New Mexico. Even though this decision proved to be a logistical nightmare, I think the film became much better because of it. I loved particularly shooting in the Indian reservations. The local Pueblo and Navajo tribes welcomed us with exceptional warmth and were extremely supportive of the production. CM: Any upcoming projects we should keep an eye out for? FS: I’m currently working on a documentary series on Afro-Latin religions that dives into the mysterious and mind-bending world of occult practices. I’m also working on two feature films. One on a similar subject, about a woman who, in order to save her marriage, moves to Colombia hoping for a fresh start, but gets entangled in a terrifying web of modern-day witchcraft. The second is a sci-fi psychological thriller with veteran producer Marianne Maddalena about a family living in isolation in an outpost at the outskirts of our solar system. To learn more about Fulvio Sestito, follow him on Twitter @forzafulvio.